Is our universe just a hologram? 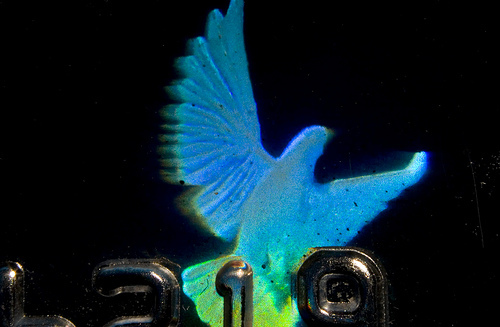 Consider the hologram sticker on your credit or debit card. The sticker itself is a two-dimensional object, a carved bit of foil with a sticky back. It contains, and is the source of, all the information to create the hologram (of a dove or whatever) which we perceive as a three-dimensional object. To put it another way, the hologram is just the projection of information which exists on that two-dimensional sticker. The same may be true of our universe. Everything we experience, everything we perceive, about our lives and the galaxy around us, may very well just be a hologram. According to this theory, which is generally well-received in the theoretical physics community, our hologram is being projected by two other universes which are connected by vibrating, infinitesimally small strings. One of the other universes has only one dimension and no gravity. The other universe has ten dimensions, eight of which form an eight-dimensional sphere. The proof comes from a recent paper which "computes the internal energy of a black hole, the position of its event horizon (the boundary between the black hole and the rest of the universe), its entropy and other properties based on the predictions of string theory as well as the effects of so-called virtual particles that continuously pop into and out of existence." I don't even pretend to understand what it all means, but the mathematical proofs of this paper serve as a Rosetta stone for string theory, which physicists have been searching for. This new information is going to encourage a lot of people to bring up the topic of the 2004 movie "What The Bleep Do We Know?" I'm going to stop you right there and say, don't. "What The Bleep" was almost completely fabricated, and was funded entirely by the cult of Ramtha. "What the Bleep" has given all discussions of theoretical physics a bad name, by taking the basic concepts and shoehorning them into a framework of bizarre mysticism. What does it mean that we live in a holographic universe? It doesn't mean that everything around us is fake. It's all real, the same way that the little hologram dove on my credit card is real. I'm not imagining that dove; I can actually see it. What it means is that what we see is not the whole story. It's just the product of the "real" universe, the way that a heat shimmer is the product of a fire, or the 3D-looking dove is just a product of the sticker on my card. Slender Man: The creepiest mystery of all?